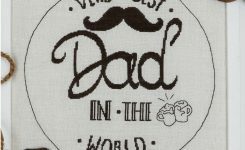 Mother´s Day embroidery pattern - Discover a lot of free charts for embroidery! Soon is mother’s day and you want to make your mother a very special joy? Then this is exactly the right thing! Handbook is currently in the trend. With a floral print, you can easily bring bright colors into the game. So your Mother’s Day gift becomes a real eye-catcher. Let’s go! Cut the fabric to a size of 50 x 50 cm. Using a sewing machine, sew all the way around the edge in a zig-zag stitch or with an overlook machine, so that the fabric won’t fray later when being printed on or embroidered. Find some pretty flowers from the garden for printing – dandelions were used here – and put them in a vase so they stay fresh during printing. You should have a separate flower for each colour you want to use in the print. The appearance of the print will vary depending on what flower it is – so try first if you want to use a different flower than a dandelion. Before beginning with the colourful flower print, you should take the trick marker and draw a 30 cm circle on the fabric. Mark a small circle in centre of the large circle – this will make it easier for you to centre the embroidered lettering in the middle of the circle. But keep in mind, that the trick marker will start disappearing by itself after a while! Before you print the fabric, it’s a good idea to make a test print for your colour combination on a scrap piece of fabric. Use the brush to apply the paint to the dandelion and simply stamp it onto the desired place on the fabric. Stamp it in a width of approx. 6 cm on the entire frame within the circle. Now, embroider the lettering double-threaded on the fabric according to the template. Use the centre of the circle you marked before (also marked in the template) to orient yourself so that the motif will later be in the middle of the circle of flowers. Now, frame your finished message in the white picture frame and make your mother happy!